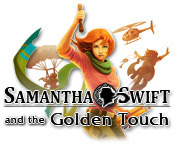 Samantha Swift and the Golden Touch is rated 4.6 out of 5 by 9. Rated 5 out of 5 by upsysydaisy from Does Samantha Ever Sleep?? Samantha is a very busy girl, with more than enough adventure! I love all the Samantha games, but I think this one has more to it than the others, For me, it was about 6 hrs long and I greatly enjoyed every moment. The story was good and uncomplicated, the goals Samantha had to achieve required lots of work and travelling all over the place. I loved the graphics, very colorful and interesting. Each scene had an extra special element to it to keep your progress moving along. And if you love HOGs, this game will please you to no end. The hidden objects are usually small and well hidden and more than one step is required to find your items and get on to your next location. Loved all the interactivity. A different kind of hint system which added a little more challenge, but a good kind of challenge, The music was not irritating as in so many other games. Absolutely, IMO. top quality all the way. I wish there were more of these games available...challenging, fun, busy. No demons, lunatics, dark castles, etc. It was good versus evil, without all the sinister stuff. I love Samantha Swift adventures and I highly recommend this game. Rated 5 out of 5 by arnold1049 from ANOTHER SERIES TO COLLECT I found this game by checking every day on the website for games listed in the various areas that might catch my eye. I particuarly look for good SE games that don't have a CE available so I can use up my free game coupons. This is how I found this game and it has led me into the whole Samantha Swift series. This game has a good storyline and lots of HOS to play. I ended up playing as Samantha because I didn't realize you had to change players in order to play under your own name. Samantha's sidekicks are good and add a lot to the storyline. There are no voiceovers. Samantha goes all over the world looking for the Golden Torch while at the same time keeping it out of the hands of the bad girl. Along the way, as do all good archeologists, she collects various items and brings them back to exhibit in the museum. At the end of each chapter there is a summary of all the items collected for the museum and you can visit the museum to see them displayed. The graphics are cartoonish but the HOS are, I think, pictures of various paintings, perhaps famous. I'm not into art so this is just a guess on my part. Some items are easy to find, others not so easy. The darker pictures seemed to be more difficult. Some scenes were repeated but with different objects to find. They were a good enough challenge to keep me from getting bored. 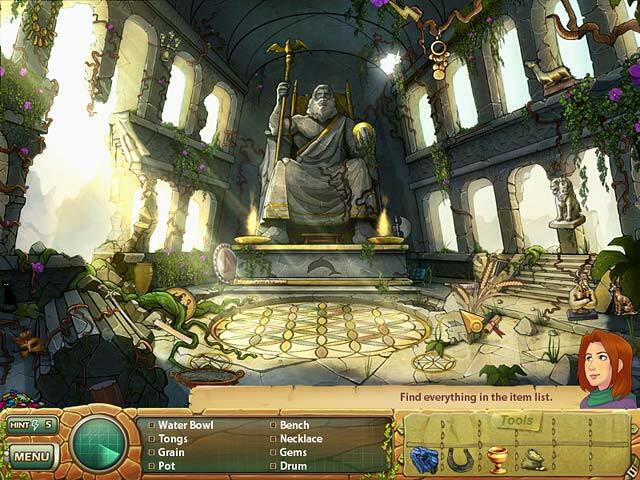 This is a nice, linear, hidden object game, heavy on the hidden object scenes. Rated 5 out of 5 by PokemonGirl131 from Great game! This game is over all great. I've played it so many times! Each time there are some new objects to find. Great storyline. I love the ending. Rated 5 out of 5 by cathain3 from Fun characters, great atmosphere Sam Swift is the female Indiana Jones. All the Swift games are pretty easy in regards to the HO scenes, but the characters are fun and the plots are well thought-out (though not perfect). Definitely worth the 7 bucks on Big Fish. These games might not be hard, but you never get tired of playing them over and over. this games has some of the best graphics of the series. Also, you should play them in order; this one is second. Roses of Athena is the first game. Rated 5 out of 5 by AlNuaimi50 from Fun Hidden Object Game! Its a very nice game and I loved it so much!! Rated 4 out of 5 by rosekaufmann from LOTS OF HOS Almost 6 hours. 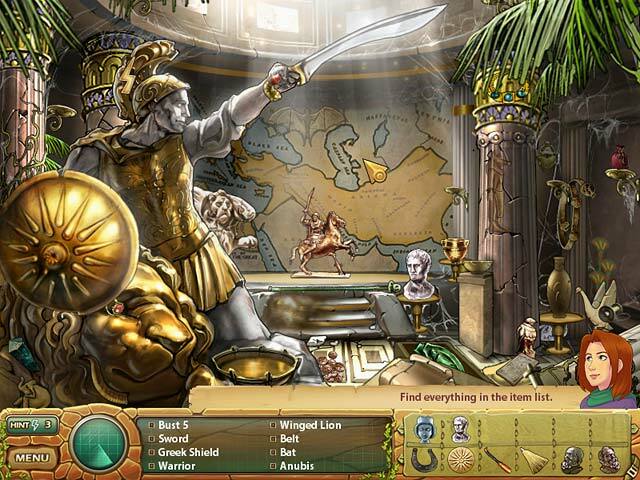 Join Samantha on archeological digs to find items for her Museum of Lost Secrets and find the treasures of Midas. The story is nice, although I lost in interest in parts of it (since this is the 3rd or 4th time I’ve played it). Of course, our protagonist has an enemy after her goodies. In the first scene, you will find a scanner which you can use for hints and a PDA which will provide information about the museum, Sam’s contacts, and a travel log. You can also customize your settings here, including the color of the PDA. Plenty of HOS. You must finish the HOS and puzzles in each room before you gain passage to another. There is no back and forth. Many HOS – each scene has two HOS lists. Items in blue are hidden and require you to use a tool in your inventory to find. You can click on an item and see its silhouette in the scanner. If you then click on hint, you will be shown its exact location. You must have hints available, though. Scour each scene when you first arrive for a lightning bolt to get additional hints. There is no limit to the number of hints you hold. Relaxing piano music – track changes periodically. Replayable – a new list of objects is generated each time you play and the location of the lightning bolts and items may move. Items in the HOS are fairly displayed and the items in the scenes have a fair approximation to the time period portrayed. Colorful artwork – very few dark spots. 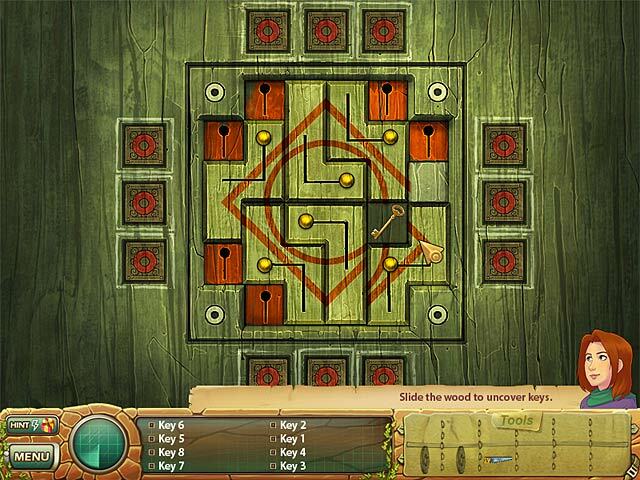 Puzzles are varied and not too difficult. Nicely put together. Rated 4 out of 5 by Wandakal1 from Great for the younger players or laid back types like me! This is a nice solid, long game, good for younger players because you can view images & also locate where they are, unfortunatley the special hidden items are not as easy, so some assistance will probably be needed. I have grands and wish there were hidden object games for the "not yet reading", or "learning to read" levels. This is one of the few I've found that is 1/2 way there. Rated 3 out of 5 by animefan18 from Samatha Swift and the Golden Touch Chess Geber hires Samantha Swift to find Alexander's Scroll of Wealth. Unfortunately, Chess isn't as innocent as she seems. Can Samantha stop her former employer from acquiring the Midas touch? The plot is similar to the last one with a different target in mind. This time, Samantha Swift has to reassemble the heart of Midas and find each one of his desires. The same characters from the last game help her out along with a few new ones. One of the new characters comes with a scene that references the movie Casablanca. The game play is just like the last one. You go from scene to scene collecting objects. The game will add some objects to your inventory so you have an easier time completing the list. You can also collect hints in the form of lightning bolts. Oh, and advancing through the game will require you to complete some mini-games. This game is not deep and yet fun. I give it 6 out of 10; a good way to spend your time. Join the fearless Samantha Swift on her journey to unravel the mysteries of King Midas’ Golden Touch before it's too late!